I didn’t notice it at first, but I was lying on my back the other day and realized that one of my carpal pads is pink and the other one is black. Seems like I’ve got a bit of carpal syndrome going on. Probably too much typing for the blog. I tend to use my left paw a bit more when pounding the keyboard in pursuit of a deadline. I put an ad in Crateslist for a secretary to handle some of the typing chores, but only three cats, all of questionable reputation being toms, one hamster and a guinea pig replied. I’m not opposed to male secretaries, but the cats didn’t seem to fit in with Pepper’s family blog. One even sent me a suggestively rude response to my “We’re sorry, but your qualifications ….” email. I rest my case. Ms. hamster was well-read having gone through the Bones N’ Crates 14 volume Amazing Animal Literature Classics, including my favourite, Gaston And Josephine, but she was a bit fidgety, and lacked a sense of humour. I wasn’t sure about working with a guinea pig, but she assured me she really was an agouti. However, she was one of those hairless ones called Skinny Pigs. Not sure about having a skinny pig for a secretary. “Oink, this is Ms. Skinny Pig … I’m sorry, Pepper’s in an editorial meeting. How can I help you?” Not the image I’m looking for. Plus, her speling and grammer was a bit weaks. Pass. So I was back to square one. Hunt and peck. Hunt and peck. I thought I’d call the vet in to get his opinion, but I was afraid he’d recommend a blood transfusion or something. So, I’m down to using my right paw for this blog. Ever since my first day at the beach, I’ve developed a taste for little crab claws. The ones at the beach were salted. And the folks at the animal protection society will be happy to know they had been discarded by the crabs. The land cousins of the sea crabs, all of about two inches big, still are a good source of calcium. But they are much harder to come by around the yard. I have some stiff competition for them. George. That’s what I call him. 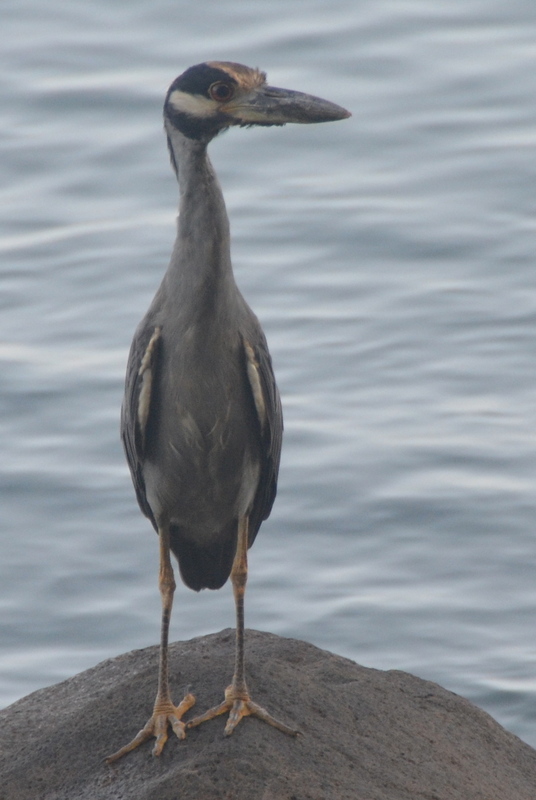 George is a Yellow-Crowned Night-Heron. He’s got cool black markings around his eyes. I can relate. But George is over two feet tall. That’s taller than the waves down at the beach! He’s like the Godzilla of birds compared to the others around here. And his favourite food is, cover your ears Skamp, little red crabs. http://www.amazon.com/The-Little-Red-Crab-Hellman/dp/1615666354. George lives for the chase, if you can call it that. George can stand perfectly still as a statue for what seems like an eternity for a puppy like me who has a hard time sitting still for more than a second. Unless, of course, I’m snoozing away dreaming of the treat truck making deliveries. So George stalks around the yard, scouting out a prime location. Then he freezes. Sometimes for entire minutes. If one of those crabs decides to take a walk-about, well George moves in the blink of an eye, his darting beak laser-fast. Breakfast served. He usually eats up on the roof. Most of his leftovers usually end up in the rain gutter far away from me. I wonder if Bones N’ Crates sells puppy planes? I understand some Beagle named Snoopy use to fly around in one. Well, seeing as how George gets the lion’s share and I get the leftovers, I thought I would try my hand at catching crabs. This sitting still part is really hard. I tried it a few times and never got past three seconds. Then, I figured I would imitate George being perfectly still, just sitting on my two back legs. I kept falling over. Next, I tried stealth. I’d peek around the corner, wait for a crab to walk out just far enough, and then pounce. Totally fruitless pursuit. George makes it look so easy. Well, Bones N’ Crates doesn’t sell any planes. Drats. However, thumbing through the catalog, that’s a joke folks, I came across another interesting device … a fishing pole! The tricky bit seems to be baiting the hook without thumbs. This is not a joke. And seeing as how I’m down to one paw at the moment …. Hmm, maybe I should place an ad for a retired Night-Heron willing to go 50-50. Ahhh! Pepper, crab claws are the best but you need to come visit and try the BLUE claw variety!!! Unauthorized use and/or duplication of this material without express and written permission from this blog’s author and/or owner is strictly prohibited. 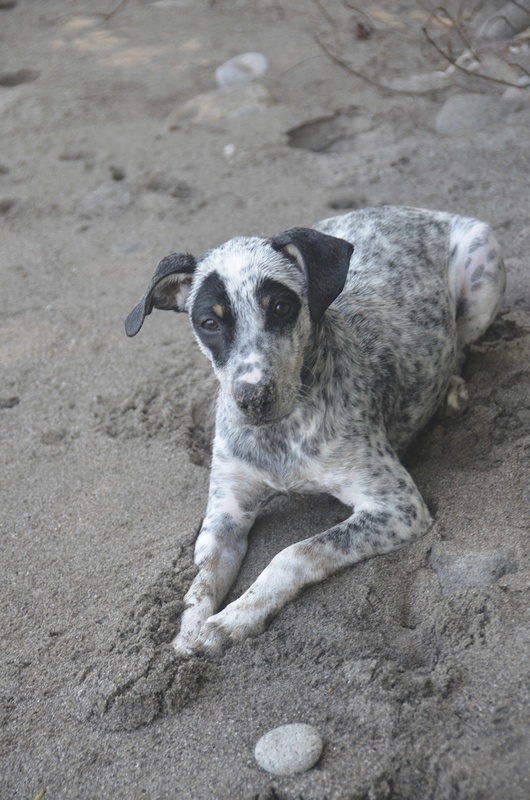 Excerpts and links may be used, provided that full and clear credit is given to Pepper at Pepper's Dog Blog with appropriate and specific direction to the original content.